OMGLondon2 starts today at 3:30pm sharp when I will be whisked off to Logan Airport by Beth and her dreadlocked husband Matt. We are having a little gathering of our twitter/bloggy friends at The V&A on Saturday afternoon. If you want to join us, email me! (melissa at yummygoods dot com) Don't be shy, we'd love to meet you! It will be an intimate little group and we will gather in the William Morris room in the cafe. Looking forward to catching up with Katy from Fat Quartly (on twitter she is @imagingermonkey),meeting Rosanne who is an amazing needlewoman (@rosannedUK), and hopefully reconnecting with Lisa from u-handbag (@uhandbag) if she can make it. I have not been very good about keeping track of things, so I may be forgetting someone who plans to join us! If so, email me to let me know you are coming! Beth and I keep jokingly referring to this as when we will be Receiving Callers. We like to imagine a concrete-faced butler standing at the doorway announcing everyone by their Twitter names: "May I present (at) I'm A Ginger Monkey, my ladies?" We might be a little bit silly, is the thing. Anyhoo, Beth has written a lovely post detailing what other things we are up to this time around. Here, go read it. Beth ordered a whole ton of muslin several weeks ago and it arrived packaged like that. 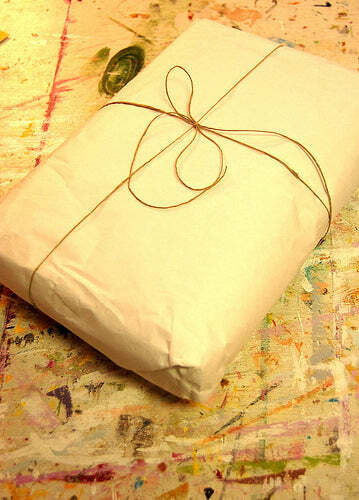 All things should be wrapped in this way, don't you agree? It elevates even inexpensive utilitarian fabric into a treasure. Why did Beth purchase all this muslin (which we have taken to calling Peasant Muslin, by the way)? Well, see, the thing is, she didn't only buy Peasant Muslin. 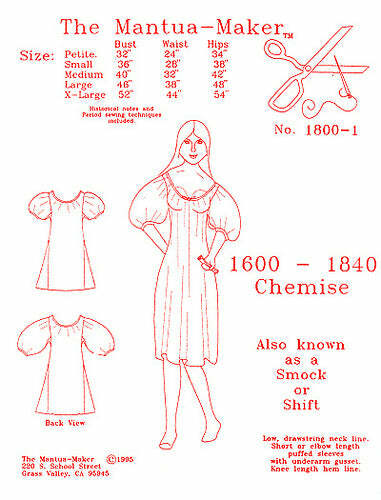 That's right, a historically accurate Regency-era nightgown/shift pattern. 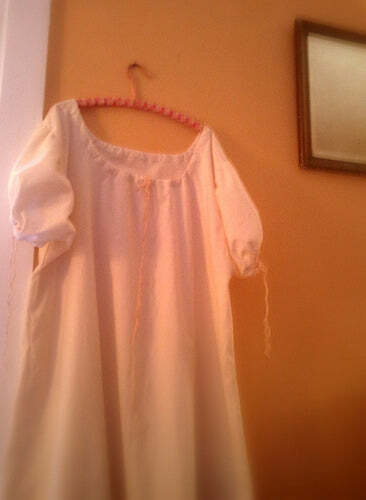 So for I could make us some historically accurate Regency-era nightgown/shifts to wear in Actual England! Which I totally did! And which I have totally been wearing every night to bed and loving like crazy. (I crocheted the drawstrings!) Back soon with OMGLondon Part 1! Prologue: Holy Sh*t, We are totally going to London. OMGLondon Part 1: I see famous people. OMGLondon Part 2: We heart Bath. OMGLondon Part 3: Crafty goodness at Salisbury Catherdral. OMGLondon Part 4: Yummy textures and yummy vittles at Salisbury Cathedral. OMGLondon Part 6: Sculptures at the V&A. OMGLondon Part 7: Quilt exhibit at the V&A.